I’m not interested in personal attacks or in the projected images of would-be puppets of corporate power. However, I am interested in why Trump is so popular among the Republican base and increasingly with Americans in general. A Fox News poll (which has the largest sample size and the smallest margin of error among all of the recently released polls) has Trump in the lead at 18 percent, with Bush in second at 14 percent. Trump is up even more after trashing McCain, now at 24 percent according to a poll by the Washington Post released today. 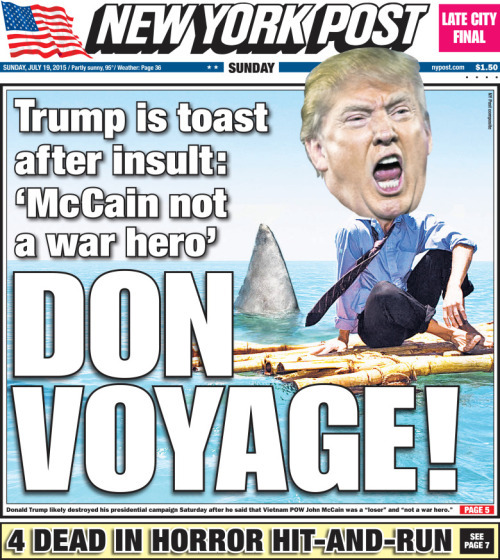 The Post thought Trump was dead in the water after going after McCain. It is totally typical for liberal elites (Yes, the Post qualifies) to completely misunderstand Trump’s appeal and why he will continue to be a powerful player. Republicans do not support him because he is compassionate or even fair. Trump is a demagogue, appealing to a broad disenchantment with the state of the country. He says a few things which people believe are true and that gets him some attention. But what really attracts the Republican base to him is his vitriol. He is an embodiment of their pent up rage. Sociologist Arpad Szakolczai notes whenever a society goes through a period of dramatic social change, “trickster” personalities arise. The most obvious historical example is Hitler, a bombastic fool that would never have been able to seize power if not for the hyperinflation and political dysfunction that epitomized the late years of the Wiemar Republic. The trickster in a normal society is an outsider who would normally be a clown like figure, but in a time of great social stress they suddenly become deadly serious, enthralling people with their language and ready to create Faustian bargains to enslave the public. Throughout mythology, examples of the trickster abound including the German fairy tale of Rumpelstiltskin and Loki, the gender-bending shapeshifter of Norse mythology. Typically however, the trickster is not totally evil or totally good. Trump gives his party what they want: revenge and righteous fury, which they hope will dignify their lives, so often devoid of real meaning. Trump makes vitriolic statements more directly than most establishment politicians dare. He previously accused the Mexican government (which incidentally is a puppet state of the US government) of “bringing their worst people” to America, including criminals and “rapists.” Broader policy aside, Trump’s simple world view mixed with his condemnation of the establishment is a recipe for success. Hannah Arendt wrote the primary appeal of the totalitarian culture, perhaps any culture, is that it can create “a lying world of consistency which is more adequate to the needs of the human mind than reality itself.” This psychological need for certainty and direction can be provided by a demagogue playing on an emotionally deflated people. Americans cannot stand that the world does not make sense. So much about life seems arbitrary, directionless and futile. If our cultural myths are inadequate to the task of creating meaning and purpose, we search for new meaning. Bombastic rhetoric is one such method and Trump is willing to supply some of it. This is part of a subconscious hostility, our “rage to live” as Belgian writer Raoul Vaneghime described it. This hostility is profound in the US, especially among Republicans. They want someone to smite their enemies with unrelenting force. It is through this violence the hate filled Republican party hopes to subdue their own demons. Liberals meanwhile hate Trump with a passion. Not primarily because of his proposed policies, but because he is “unpresidential.” Trump exposes the myth that our government is dignified, even as the same government commits untold war crimes. To a liberal, exposing the government as a barbaric fraud is inexcusable. The image of the president as a measured, caring individual must be preserved if the machine is to remain well lubricated and efficient. Liberals and so called progressives betray their allegiance to the system when they complain it isn’t working as well as it could, never mind how evil that system is. The United States has been extremely fortunate thus far. The country has yet to produce a sufficiently honest or violent demagogue that can rally the ignorant and desperate masses. However, that may change at any time. Update 7-20-2015: It’s worth noting that according to Left I on the News, the February 5, 2000 issue of the Philadelphia Inquirer reported that McCain’s fighter was shot down while on the way to bomb a civilian controlled “light bulb factory.” If true, it might have been a war crime. The United States did not sign off on Protocol I of the Geneva Conventions until several years later in 1977, which specifically outlawed bombing of civilian targets. Previous agreements were far less specific and only required civilians be treated humanely. There’s also quite a bit of debate as to whether or not a light bulb factory qualifies as a civilian structure, given that the military of North Vietnam used light bulbs. Of course, by that logic, there are no civilian structures anywhere. This entry was posted in Opinion and tagged Donald Trump, Election 2016, Media, Psychology, Social Criticism. Bookmark the permalink. Post a comment or leave a trackback: Trackback URL. Sean Kerrigan.com ©2016 All rights reserved.